The mythical dream-like kingdom comes into view as the aircraft swings in giant arcs and descends onto Bhutan's only airstrip at Paro. This beautiful valley with its rich terraced farmland, is home to some of the Bhutan's oldest temples and monasteries. On arrival you will be met by our local representative and transferred to your hotel. Later this evening stroll around the local Paro market. Overnight stay at the Hotel. This morning we will visit the perfectly symmetrical Rinpung Dzong, built in 1646 by Shabdrung Ngwang Namgyal, the first spiritual and temporal ruler of Bhutan. Also will be visiting the Ta Dzong - situated on the hill side, is the castle-shaped, one time watch tower built to defend Rinpung Dzong during inter-valley wars of the 17th Century, now holds the National Museum. Later in the day we will be taken on an excusrion tour, about eighteen kilometres from Paro town on south side of the valley to the burnt ruins of Drugyel Dzong (victorious fortress). It was from this monastery that the Bhutanese repelled several invading Tibetan armies during the 17th Century. Overnight stay at the Hotel. This morning we will depart Paro by surface for the capital of the kingdom, Thimphu. Enroute visiting the 17th Century Simtokha Dzong on a lofty ridge, built in 1627, the oldest in the land, houses the school for Buddhist studies. Overnight stay at the Hotel . This morning we set out on a sightseeing tour of perhaps the most unusual capital in the world is a bustling town on the banks of its own river and gloriously in the hills of its own valley - is the centre of government, religion and commerce. This morning we continue on our drive to Punakha, the road winds up from Simtokha Dzong into the pine forest and through small villages for 20 kilometres and then opens miraculously onto the northern ridge of the mountaints. The view over the Himalayan panoply at Dorchula Pass at 10,500 feet is one of the most spectacular in all Bhutan. 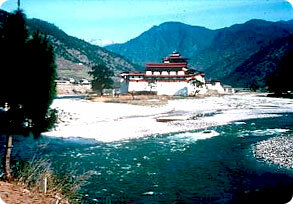 Punakha served as the capital of Bhutan until 1955. In the evening stroll around the town. Overnight stay at the Hotel. This morning we will visit the Punakha Dzong, strategically built at the junction of the two rivers in the 17th Century by the first Shabdrung to serve as the religious and administrative centre. It also houses sacred temples including the Marchen where the embalmed body of Shabdrung Ngawang Namgyal lies in state. The Dzong has been fully restored by the present King. Later in the day we continue on our excusion to Wangduephodrang - is the last town on the central highway. A visit to the Dzong, is the town's most visible feature, played a critical role in unifying the western, central and southern Bhutanese districts. This morning we continue on our drive back to Paro for final adventure trip. Relaxing or shopping with own activities . Overnight stay at the Hotel. © 2004-2008 Himalaya Journey Trekking & Expedition. All Right Reserved.